Does "The Protector" sound like an odd name for a bad guy to you? 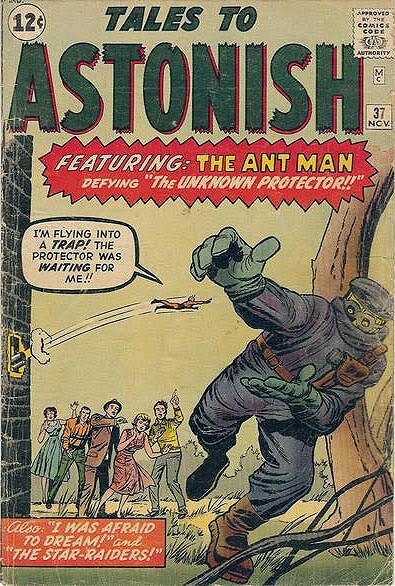 Turns out that it's in the sense of "protection racket", and therefore hews closer to the penchant for realistic villains found in Golden Age comics. On the other hand, this guy carries a disintegrator ray. If you've read any number of Larry Lieber comics featuring a masked villain, it's an easy guess as to the identity of the bad guy at story's end. It's also no surprise that the explanation given for how he accomplished his feats makes no amount of sense whatsoever. appears nowhere else in the whole of human history. Also: Yes, the baddie is really using a water pistol. He's scary.